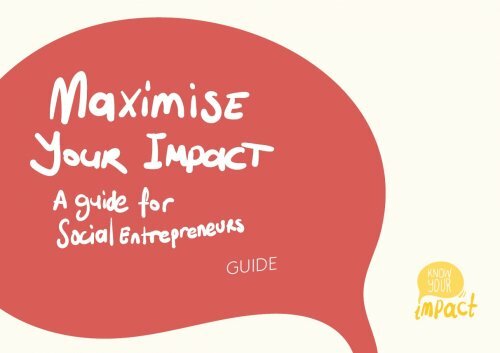 This guide is written for social entrepreneurs who want to maximise their positive impact and want a practical approach to help them do that. By impact we mean creating changes in people’s lives. You could be already running a social enterprise or on the way to setting one up. The key to this approach is ‘Impact Thinking’ and at its heart this means involving and being accountable to stakeholders, primarily those that the social enterprise aims to support. It is about collecting data from stakeholders to improve the design of products or services aimed at addressing a particular social issue. This guide does not tell you how to produce an impact report. We hope that users of this guide will focus on producing recommendations: to change, stop or scale their activities. However this groundwork will also make it easier to report your impact to funders and to let them know how you are using data to inform change. There is much more that could be said about how people can go on to develop and co-produce new products and services, especially as an opportunity for innovation. If you don’t intend to change anything you are doing as a result of thinking about your impact, or you only want to confirm that you are having an impact, then this is probably not the guide for you. What is Impact Thinking and why is it important for social entrepreneurs? Create (or review) your strategy and business plan which will include an impact management plan and an operations plan. Carry out user research, testing and co-design of products and services. • 1: WHAT PROBLEM ARE WE TRYING TO SOLVE? • 2: WHAT IS OUR PROPOSED SOLUTION TO THE PROBLEM? • 3: WHO EXPERIENCES CHANGES AS A RESULT OF WHAT YOU DO? • 4: WHAT CHANGES ARE EXPERIENCED (OR ARE LIKELY TO BE)? • 10: WHICH CHANGES MATTER AND ARE IMPORTANT ENOUGH FOR US TO MANAGE? You will design surveys and collect quantitative data from stakeholders about the changes they experience, and store and organise the data ready for analysis. • 5: HOW CAN WE MEASURE THESE CHANGES? • 6: HOW MUCH OF EACH CHANGE HAS HAPPENED (OR IS LIKELY TO HAPPEN)? • 7: HOW MUCH OF EACH CHANGES IS CAUSED BY OUR ACTIVITIES? • 8: HOW LONG DO WE NEED TO MEASURE THE CHANGES FOR? • 9: WHAT IS THE RELATIVE IMPORTANCE OF THE DIFFERENT CHANGES? • SAMPLING – HOW MUCH DATA DO WE NEED? • DATA QUALITY – IS IT GOOD ENOUGH? In Stage 3, you will analyse the data you have collected. • SHOULD YOU STILL BE TRYING TO ADDRESS THE SAME PROBLEM? • IS YOUR DATA GOOD ENOUGH? • STOP, CHANGE OR SCALE? Embedding Impact Thinking into your social enterprise means continuously focusing on the changes you create for stakeholders in order to maximise your impact.